Hidden Vegetable Spaghetti Sauce takes a favorite kid friendly and packs it full of extra veggies without their knowledge. Getting your kids to eat better will be no issue when veggies are hidden in this sauce. 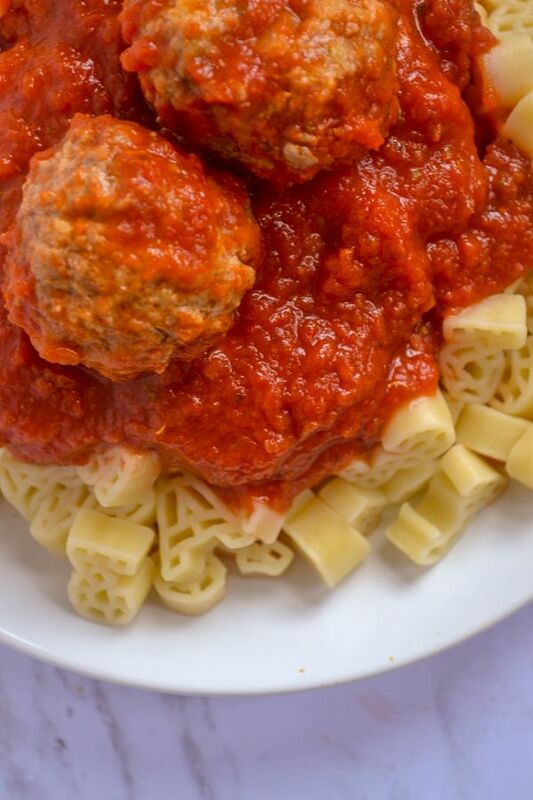 Add on top of your family’s favorite pasta with some meatballs with zucchini and a sprinkle of cheese for a simple dinner. Or, smear on whole grain bagels with cheese for a healthier twist on pizza bagels. 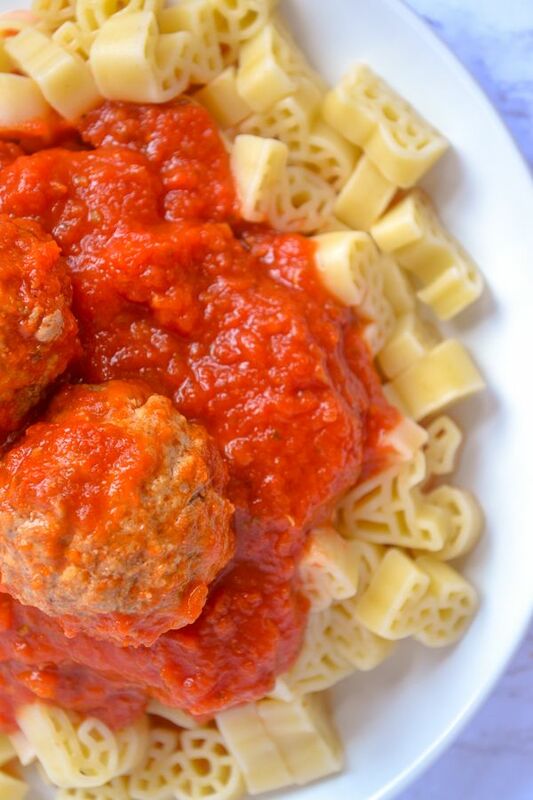 This pasta sauce for kids is the perfect recipe for picky eaters. No matter how you use it, you’ll love knowing that your kiddo is getting in extra veggies without the hassle. 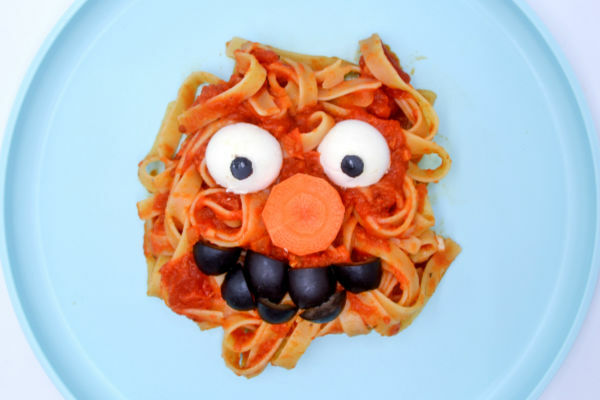 Add even more kid friendly fun to this recipe by piling it over a funky pasta like this ABC variety. I get asked a lot if my kids are ‘great eaters’. Totally valid question being a blogger who focuses on healthier eating, picky eaters, and getting them to try new things. But, the reason I can talk honestly about this topic is that I have hit the stubborn kid wall. You know, the wall when something that was your kids absolute favorite last week is now public enemy number 1. Most commonly, this happens with vegetables in our house. The frustration is why you can find so many hidden veggies recipes on this site. They’re my favorite recipes for picky eaters! One week I can’t give Ryan enough carrots – steamed, raw, roasted, it doesn’t matter. He’s eating them faster than I can buy them, dipping them in his favorite Greek yogurt ranch dip. I’m starting to worry if he’s going to start looking a little Oompa Loompa orange soon. And then, just like that, it’s over. He’s picking carrots out of fried rice and can’t bear to even have them on his plate. Ahh, such is life with small children, amirite? Little about living with preschoolers is consistent or reliable. 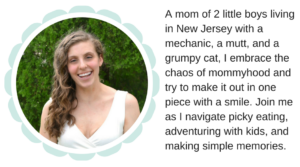 It is why I have learned tips, tricks, and recipes to deal with fussy, stubborn eaters. Because you just never know when a veggie boycott is coming. One of those boycotts is what spurred on this veggie sauce. Ryan was having a week. You know, the kind where he only wants to eat neon orange fish crackers, juice boxes, and yogurt. Because he’s a big boy and should be able to choose his entire diet. Whether or not it totally messes up mom’s meal plan. The only meal we could get into him was spaghetti and meatballs. So in a fit of fed up fury, I blended up some random veggies I had in the fridge. Next, I cooked it into our normal pasta sauce, and voila. A serving of veggies for picky eaters without the struggle. Can I get an Amen? Use whatever veggies you have in your house. I suggest trying lighter veggies as they will be less detectable and blend right in. If you have leftover puree, either add it into the sauce or freeze the extras in ice cube trays. Add to smoothies and sauces as needed for the perfect hidden veggie add-in. Don’t want to blend up the veggies yourself? Use baby food! Get the same outcome with even less work. Look for a brand that is all one vegetable, rather than a fruit/veggie mix. You don’t have to just use this on spaghetti. Anywhere you use tomato sauce, use this for a veggie punch. 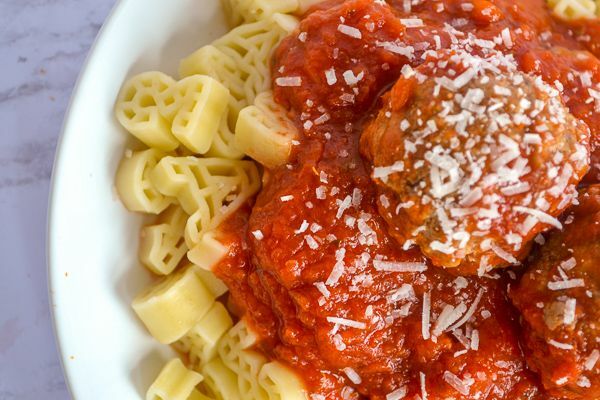 This kid-friendly spaghetti sauce is now a staple in our house. It’s such a family-pleasing meal. Adding a few hidden veggies to the sauce takes it from a basic dinner to a mom pleasing recipe for picky eaters. Win, win, win. Honestly, sneaking veggies into sauce for noodles is the easiest way to get kids to eat veggies. Try my Veggie Pesto Pasta Sauce and Veggie Alfredo Sauce for even more nutrition packed sauces kids love. Make it even more fun by using toppings to create fun faces! I used fresh mozzarella balls, a slice of carrot, and olives to make the face. It made Elmo come to life on my Sesame Street obsessed kids’ plates! What can kids help with? Choose the veggies! Just because they’re hidden doesn’t mean kiddos can’t know. Chop garlic and onion with a “slap” chopper. Measure out the olive oil. Open the cans with adult supervision. Add steamed veggies to the blender and press buttons. What veggies go with tomato sauce? You can really add any veggies into here, steaming them and pureeing ahead of time, but I find the sweeter veggies work best here. My favorites include carrots and bell pepper. Does marinara sauce count as a vegetable? Kind of. Technically speaking, a tomato is a fruit. But you can definitely count quality tomato sauce as a serving of veggies. If you use this hidden veggie option, I give you full permission to count it. 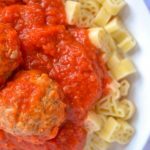 What is the healthiest pasta sauce? “Healthiest” is a tough word. If you’re buying premade, look for the least amount of processed ingredients. Also keep an eye out for added sugars. Not sure how to do it? Check out this post for how to make veggie purees..
Sweet potato – they will add a creamier texture. (1 large sweet potato. I would add something to this. All sweet potato might make it too thick. Related reads: Learn how to make vegetable purees here! How do you make vegetable spaghetti sauce? The key to hidden veggie recipes is to steam the veggies and puree before adding into the tomato sauce. This ensures that you won’t have any chunks that picky eaters will find and then refuse to eat. Steam your peeled carrots and bell peppers well, until very soft. Add your steamed veggies to a high speed blender, food processor, or an immersion blender. Blend until smooth, adding water as needed. Saute the onion and garlic in the olive oil until translucent and soft. Add your tomatoes and 2 cups of veggie puree. Cook on medium for at least 20 minutes or on low until ready to use. The longer, the better! Add salt and pepper to taste. 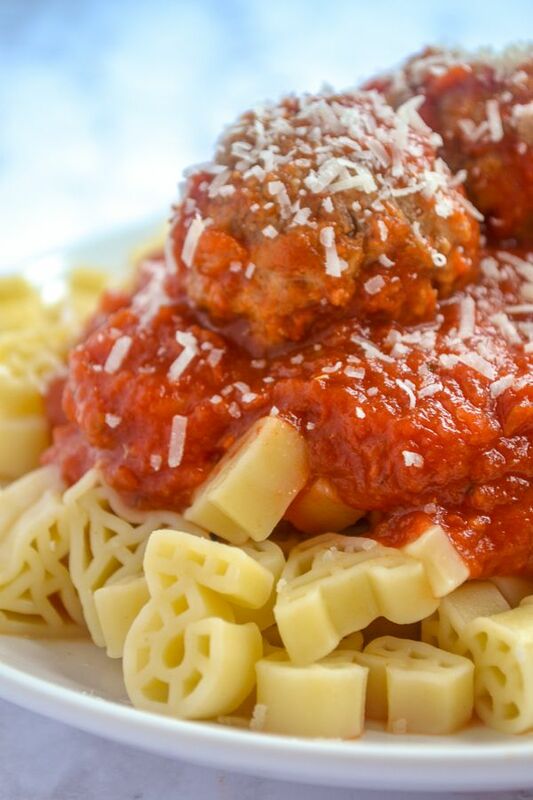 This spaghetti sauce for kids is the perfect recipe to keep on hand for quick meals. Not to mention, it’s a simple way to add more veggies to your picky eater’s diet. Use in place of pizza sauce, pasta sauce, or anything that uses tomato sauce. If you enjoy this recipe, please remember to rate it 5 stars! It helps other find it and makes my day! 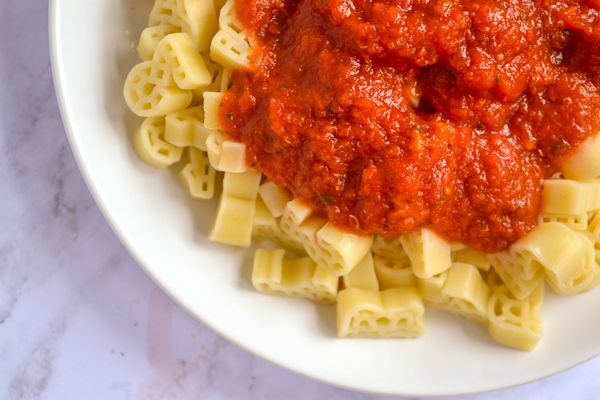 Hidden Vegetable Spaghetti Sauce takes a favorite kid friendly – tomato sauce – and packs it full of extra veggies without their knowledge. Steam or roast carrots and peppers. Blend with a little water if necessary until a smooth puree forms. Set aside. In a large saucepan, saute the onions in the olive oil over medium heat until translucent. Add garlic and cook another 1-2 minutes until fragrant. Pour in cans of tomatoes and 2 cups of veggie puree. Simmer at least 20-30 minutes, longer is better. This makes a huge batch since it freezes really well. Feel free to halve it as needed. Use whatever veggies work for you – carrots and bell peppers are sweeter and less likely to be notice. I use basil seasoned crushed tomatoes. If using plain, you’ll want to add 2 teaspoons – 1 tablespoon of dried Italian seasoning. So, tell me – it spaghetti sauce a staple in your house? What would you use this hidden vegetable spaghetti sauce on? Let me know in the comments!